Press the Get Access Code... button to obtain the Access Code. Pressing this button will open up a web browser in a new window where you can sign into the Google account you've specified in the above Email field. You will be able to preview the requested permissions and accept them. If you choose to accept these, you will be provided an access code. Use copy/paste to transfer this access code from your web browser window back into the "Access Code" entry in this dialog. 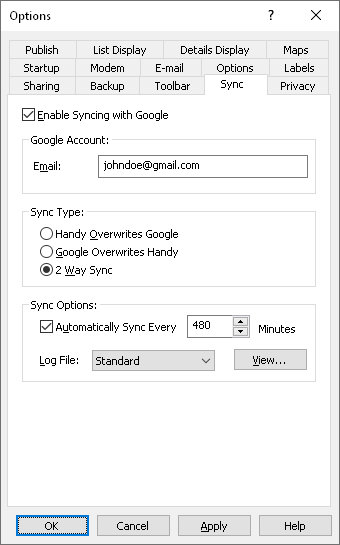 The sync options allow automatic syncing every so many minutes, or you can initiate a sync at any time using the Actions / Sync with Google menu command. See the contact synchronization documentation for more details on synchronizing your address book. If you receive an error when syncing, see our sync troubleshooting steps. The Google Sync add-on is fully functional for a trial period of 15 syncs. To use the optional add-on past the evaluation period requires a separate Google Sync license be purchased for $15.95.